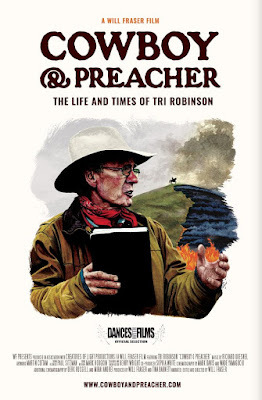 Director/Prodcuer Will Fraser announced today the world premiere for his documentary film “COWBOY AND PREACHER: THE LIFE AND TIMES OF TRI ROBINSON – A WILL FRASER FILM” is set for June 14 at the Dances With Films Festival at the TCL Chinese Theater in Hollywood, CA at 2:45 PM. Director Fraser and subject Pastor Tri Robinson will also lead a discussion and Q/A following the world premiere screening. Fraser brings to the screen the life of Tri Robinson, an evangelical pastor in Idaho who is also a life-long environmentalist, who has battled throughout his life to try to get conservative Christians, many of whom do not take the environment seriously, to realize that being a conservative Christian and an environmentalist are not mutually exclusive. Most environmental films seem to be framed for a liberal audience – i.e. they preach to the converted on the theme of "with dominion comes responsibility." "COWBOY AND PREACHER" aims at the unconverted, while also offering liberals and non-Christians a fascinating portrayal of conservative evangelical life, values and mindset. This film is absolutely timely. Not only is the destruction of the environment probably the most important issue facing all people, but also many American politicians and voters are in denial about it. In the film we see the efforts Tri makes to create a green conservative church and unite this with his life as a rancher, all the while developing a Christian system of ideas that unites environmentalism with moral development and action. The time for this discussion and for this film is now. Tickets for the screening are available at danceswithfilms.com/film-listings-documentaries/cowboy-and-preacher/.